Multiple stages, huge patio open. ONLY $10 !?!?! Plus FREE pre-party Friday Oct 28 @ QUAD. We're combining the patios of QUAD and Spring4th Center, creating a COMPLEX-wide CHAOS of surprises. Our special guest judges will be roaming through COMPLEX CHAOS all night awarding prizes to 25+ party-goers in a variety of categories. Reasonably priced and yummy burgers, soul fries, tacos, chicken n waffles. Order from any bartender. We're still adding a few more ingredients to the CHAOS so check back often. Spring4th Complex, home of QUAD, CENTER, and ANNEX is one of Atlanta’s largest venues with an approximate capacity of 3,000 and 30,000 square feet of space, with multiple entrances to get you in quickly. With an abundance of parking and hotel accommodations, prepare for ease of access and enjoyment with the option to drink, eat, and party all night long. 10 AM to 7 PM, Monday to Saturday. Also available at most QUAD or Spring4th Center events. 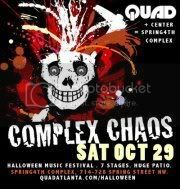 --> all pre-sales purchased prior to October 29th, will allow for FREE entry into the Halloween 2011 Pre-Party October 28th in QUAD.